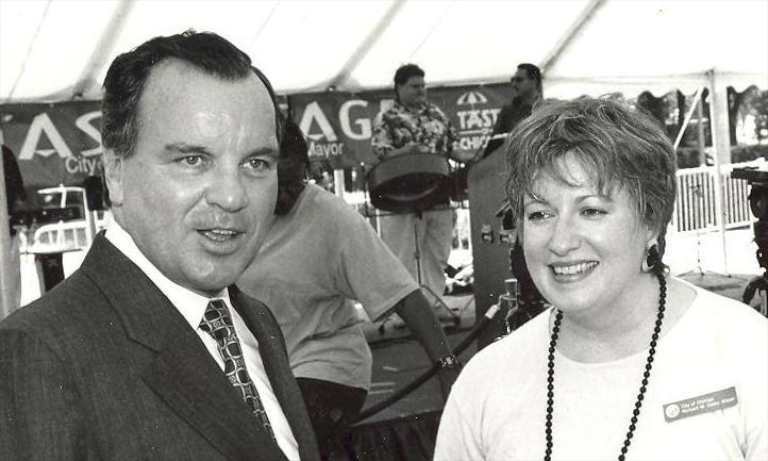 Anne’s 2007 astrological profile of former Chicago mayor Richard M. Daley, written when he was still in office, appeared in that year’s May issue of the Gazette newspaper and won a 2008 international Apex Award for journalistic excellence. The article also appears along with 11 other profiles of famous people in Anne’s astrology book, Follow the Sun. Read on to enjoy that article now, in its entirety. Over the course of every year, the Sun travels through all 12 signs of the zodiac, one month at a time. So every month we have the opportunity to experience a different astrological energy, observe how its positives and negatives unfold in our lives, and integrate what we learn to achieve a new level of personal harmony. One way to make the most of this cyclical energy is to study the lives of public figures born under the sign the Sun currently occupies. Besides learning from their mistakes, we can take heart from how they overcome challenges and take inspiration from how they express the noblest aspects of their Sun signs. Chicago’s mayor, Richard M. Daley, was born April 24, 1942, when the Sun was in Taurus. Son of powerful Chicago mayor Richard J. Daley, he grew up in Bridgeport, where he was an altar boy and attended De La Salle Academy. He served in the Marine Reserves in the 1960s, earned undergraduate and law degrees at DePaul University, and entered politics as a delegate to the Illinois Constitutional Convention in 1969. He served in the Illinois Senate from 1972 to 1980 and was Cook County’s state’s attorney throughout the 1980s. Elected in 1989 to complete the late Mayor Harold Washington’s term, he took office on his birthday and has held it ever since. Since then, he has earned kudos locally and nationally for beautification, environmentalism, and redevelopment as well as public school revitalization, public housing transformation, increased tourism, Millennium Park construction, and CTA upgrades. He also has aroused criticism for heavy handed politics, patronage abuses and other scandals, aggressive use of eminent domain, and an autocratic style that crushes dissent and circumvents consensus building and political process. Daley’s behavior exemplifies both the positive and the negative expression of Taurus’s earthy, fixed energy. For instance, instead of idealism and pie in the sky, he makes practical plans for tangible projects to build parks, libraries, and new housing developments. His administration can be depended on for garbage pickup and graffiti blasting—and machine politics and corruption. Symbolized by the Bull, Daley’s Taurus Sun Sign makes him hard working and gives him great physical stamina and a stocky, bullish appearance (much like his father, who was a Taurus, too). Daley also exhibits Taurus’s plodding nature, patience, and solid rather than sharp intelligence. Although he failed the bar exam on his first try, he persevered, finally passing on the third attempt. Defeated in his 1983 mayoral run against Harold Washington, he bided his time working as State’s Attorney rather than opposing Washington a second time and won the mayor’s job in 1989 after Washington’s death. Daley also exhibits the Bull’s love of tradition and tendency to possessiveness, seeing the mayor’s office as the family fiefdom and showing no sign of letting it go. He has expressed Taurus’s stinginess by privatizing numerous city services to reap considerable savings; he embraces its preoccupation with the material world by pouring billions of dollars into capital improvements for schools, parks and recreation, new affordable housing units, and infrastructure. Those investments embody the Bull’s tendency to seek security—both physical and emotional—via material wealth. Daley also has addressed this urge to security via community policing, adding more than 1,000 officers to police ranks, and bringing an innovative lawsuit against gun makers for the toll their products take on the city. His security fixation veers sharply to the negative when, out of self-interest, he refuses to debate candidates running against him, enriches pals by allowing them sweet deals on city land and contracts, jealously guards power for himself, and insists on controlling the City Council—even though Chicago’s government was designed as a strong council-weak mayor system. When the City Council actually defied the mayor last year by passing an ordinance requiring big box retailers to pay employees a living wage, Daley killed the measure with his first veto since becoming mayor. Daley also exhibits Taurus’s stubbornness and resistance to change. Although two separate courts had overturned a Chicago ordinance allowing police to gut the U.S. Constitution’s guarantee of freedom of assembly by ordering people congregating in public spaces to disperse simply based on suspicion a gang member might be present, Daley kept pushing for the ordinance. He also has made himself notorious for bullish outbursts of temper whenever anyone crosses him and when the press asks legitimate questions about his decisions or his administration’s actions. In his personal life, Daley upholds Taurus’s focus on family, stability, and loyalty. He went into the family business and now holds the job his father once did. He has been re-elected five times with large majorities. He met Maggie Corbett, an executive at Xerox, in 1970 and married her 15 months later. The Daleys have two daughters and a son; their second son was born with spina bifida and died in 1981. When his wife was diagnosed with cancer a few years ago, initial media reports were followed by an information clampdown. In small groups and secure and comfortable settings, Daley displays a charm directly attributable to Venus, which rules Taurus. Venus also gives him a loving nature, especially when it comes to his native city, and an overriding need for beauty and the pleasures of nature. Regardless of their opinions about the mayor, locals and visitors universally say “the city has never looked better,” thanks to nearly half a million trees planted, almost 70 miles of landscaped street medians, rooftop gardens on major buildings, and Millennium Park’s debut in 2004. The arts also have flourished under his watch, with the Department of Cultural Affairs presiding over much of this creative renaissance. The price tag for Taurus’s good taste and aesthetic sensibilities is considerable, Daley’s devotion to fiscal responsibility notwithstanding. To finance his vision of a modern urban oasis blending nature’s splendor with green buildings and ample cultural offerings, Chicago’s citizens have seen their property taxes double—even as the mayor and City Council insist residential tax increases are capped at seven percent. Daley’s love of nature has made him a national environmental leader, especially when it comes to planting trees. His fondness for cycling spurred him to create numerous bike paths and lanes and install bike racks on public transit. He has implemented green programs such as recycling, water conservation, and river restoration. In the mid-1990s, he conceived a plan to turn Meigs Field from an airport for the few into a park for the people; in true Taurus fashion, he waited out Downstate opposition and then acted immediately to demolish the site in 2003 after a short-term deal to keep the airport open expired. Shocked at this act’s suddenness—out of character for the reliably steady Taurus—opponents brought legal action, but the courts affirmed Daley’s power as mayor allowed him to restore the property to parkland. In assessing the mayor’s behavior as a child of Taurus, we have abundant examples of this sign’s noblest qualities—and its negative ones. During this Taurus time, all of us can make the most of this sensual, earthy energy by avoiding possessiveness and misguided attempts to gain security by hoarding power, money, and belongings or by forcing our will on others. To nurture loving relationships, we can remind ourselves that our way is not the only way and often may not even be the best way. As we let go of the need to control others, we can embrace the compromise, consensus, and cooperation that bring harmony and yield effective and lasting solutions. By looking at ourselves honestly and making sincere efforts at improvement, we can overcome Taurus’s negative tendencies. In the process, we can gain an inner state of true security that provides long-term happiness and balance. From that place of strength, we can be steadfast in expressing the Bull’s best traits: loyalty, devotion, and love of nature. This award-winning profile appears with 11 other profiles of famous people in Anne’s astrology book, Follow the Sun: A Simple Way To Use Astrology For Living In Harmony. This timeless, annual guide to using astrology for living in harmony also reviews each astrological sign and shares simple yet powerful ideas for making the most of that sign’s energies and opportunities. It’s a full color book that includes all of Anne’s original watercolors, one for every zodiac sign, to make astrology not only practical but beautiful.